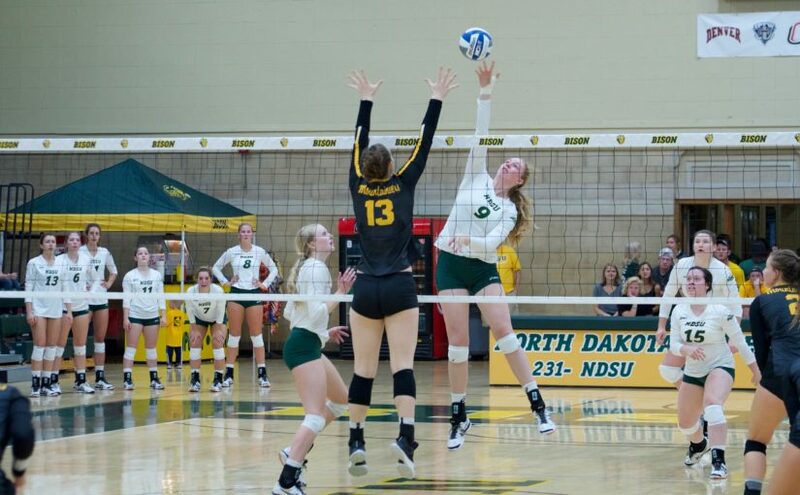 North Dakota State women’s volleyball hosted George Washington and Appalachian State in the NDSU Invitational on Saturday, winning both matches. NDSU played its best game of the season in game one against George Washington. Posting a 3-0 (25-16, 25-20, 25-9) victory, the Bison out hit the Colonials .345 to .048. Erika Gelzintye connected for 10 kills and hit .348. Brianna Rasmusson added four kills while dishing out 30 assists. Six of Emily Halverson’s seven kills came in the first set, as the Bison where able to pull away in the back-and-fourth set that saw eight ties and four lead changes. McKenzie Burke helped with two of her five kills to put the Colonials away in the set. Bella Lien lead the Bison at the net with eight blocks, two solo and six assists, as the Bison finished with 10 blocks. Mikaela Purnell finished with a match-high of 15 digs. Rasmusson and Burke each had three of the Bison’s seven service aces. In the second match of the night for NDSU, the Bison had a to finish the Mountaineers in five sets. Appalachian State defeated George Washington 3-2 in Saturday’s middle match. In the first set, the Bison were outhit .061 to .353. Lexi Kohut and Melissa McMath each connected for five of the Mountaineers 16 kills in the set. In the second set, the Bison were able to outhit ASU .171 to .094 with five kills coming from Gelzinyte and six coming off the hand of Burke. The score would be 1-1 (16-25, 25-18) going into the break. The third set saw two lead changes and five ties. The Bison would fall early 1-2, before taking a 3-2 lead. ASU would continue to battle and tie the set at 7-all before the Bison would put it on cruise control and take the set 25-17, giving them a 2-1 set lead. The Bison outhit ASU .385 to .222. The fourth set would not be a good one for the Bison. In a set that saw no lead changes or ties, the Mountaineers took the lead and didn’t look back. NDSU kept it close and took a timeout trailing 17-19 to attempt to regroup. After the timeout, the Mountaineers would take six out of the next eight points, with a kill by Courtney Sullivan to finish the set 25-19 and force a fifth and final set. The Bison were outhit .140 to .364. The Bison took an early 7-3 lead after Rasmusson aced a serve and Gelzintye and Burke combined for six kills. The Mountaineers would come back and take a late lead 12-11 after two kills from Kara Spicer. After a timeout, the Bison would capitalize on a couple of errors and a tip from Rasmusson to take a 14-12 lead setting up match point. ASU would come back to make it 14-all, including a block from Sullivan and Ashly Brown. Sullivan finished with a match-high six blocks. NDSU would finish off the Mountaineers with a kill from Gelzinyte and a block from Allie Mauch and Lien to win the match 3-2 (16-25, 25-18, 25-17, 19-25, 16-14). Burke and Gelzinyte each finished with 18 kills as Halverson added 10 kills as the Bison three hitters in double digits. Rasmusson dished out 46 assists to go along with her seven kills, seven digs and three blocks. Abbi Klos tied a career-high with four aces, as Purnell came up with 24 digs and three aces. Purnell has had double-figure digs in 28 straight matches and 62 in her career. NDSU (6-3) is scheduled to play in the Florida Atlantic University Invitational on Sept. 15-16 in Boca Raton. The Bison improved to 5-0 at home this season.